By the end of last month, I was doing my own head in a bit. I had read a series of very bleak novels in quick succession, namely Of a Boy, Room and We Need to Talk About Kevin. Without exception, these are stunning stories, well worth the telling, but by the end of my reading of them I was well and truly ready for something a bit lighter. It was high time for some Young Adult fiction, so I picked up Andrew Lane’s Young Sherlock Holmes – Fire Store (Pan MacMillan). Fourth in the series, Fire Storm has been on my reading pile for a month or so. Evan enjoyed reading it over the summer holidays, and has since become completely obsessed with everything Sherlock. Firstly, it was really special to be able to share a reading experience with Evan. Every time he caught me reading, he’d quiz me on where I was up to, what was happening, what I thought. Sherlock is believably ‘young’, learning his craft and struggling with an ominous family legacy. His entourage are fascinating and likeable, Matthew ‘Matty’ Arnatt’s street-smarts compliment Sherlock’s sixth sense well, and Rufus Stone provides a reassuring adult presence, and makes the whole adventure that bit more believable. There’s even the obligitory special guest appearance of Sherlock’s brother, Mycroft. Although written for readers 11-years and older, Lane hasn’t dumbed the story down at all. It’s written accessibly but it’s also packed with suspense, thrills and an age-appropriate level of action. Some kids might find some of it a little bit scary, but I suspect that most eleven-year-old boys wont think twice about the more frightening parts of the story. 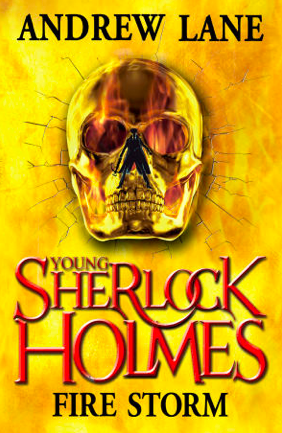 I thoroughly enjoyed Young Sherlock Holmes – Fire Store and am looking forward to going back and reading the first three books in the series. Good thing is, Evan was equally impressed so I’ll be able to pass the purchase of the books off as for him, I’ll sneak a read and then add them to his collection. Clever aren’t I? Which is your favourite manifestation of Sherlock Holmes character? Excellent! I’m off to add them to the Kindle for T. He keeps re-reading the Hunger Games series, which is great, but I need to whet his appetite for something else! Will you let me know what he thinks of it?